I happened to have a gorgeous purple Napa cabbage for this batch. There are entire books on this wonderful Korean condiment and it can be made with many different kinds of vegetables, spices and aromatics. Here is a fairly basic version that uses the traditional Napa cabbage and various roots (carrots, daikon, other radishes). 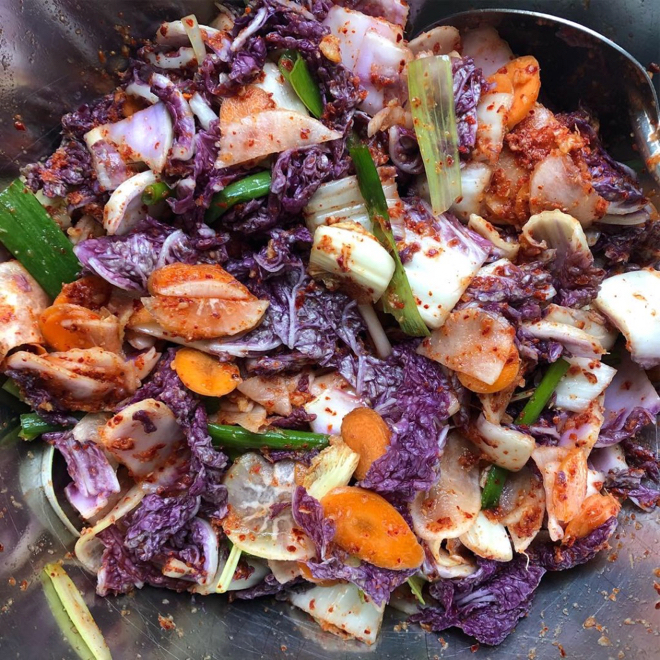 Kimchi typically uses gochugaru, a smoky, sweet and somewhat hot coarsely ground chili powder. If you don’t have gochugaru you can substitute a combination of red pepper flakes (spicier than gochugaru) with some smoked paprika and/or chipotle powder. You’ll want to use a smaller quantity to account for the increased heat level of the red pepper flakes. Kimchi-making does not have to be exact, you just want to be sure to have very clean containers and work surfaces. Make brine by combining salt and water. I make it in quart jar, shaking the jar until the salt dissolves. Put the cabbage and roots in a large bowl and add brine. Cover vegetables with a plate and weight it down (with cans, etc.) to submerge vegetables completely. Let sit for a minimum of 2 hours or up to 10 hours/overnight. Drain vegetables, reserving some of the brine. Add scallions to drained vegetables. Put gochugaru in a medium bowl. Process onion, apple/pear (if using), ginger, garlic, fish sauce in food processor into a paste and add it to gochugaru and mix well. It should be a loose paste. Fill your fermentation container with the mixture. Do not pack it too high or too tight. Press down to unsure the vegetables are completely submerged. Add a little leftover brine to cover completely if needed. Weigh down your vegetables with a clean glass jar (or ziploc bag) filled with water or leftover bringe to keep vegetables submerged. 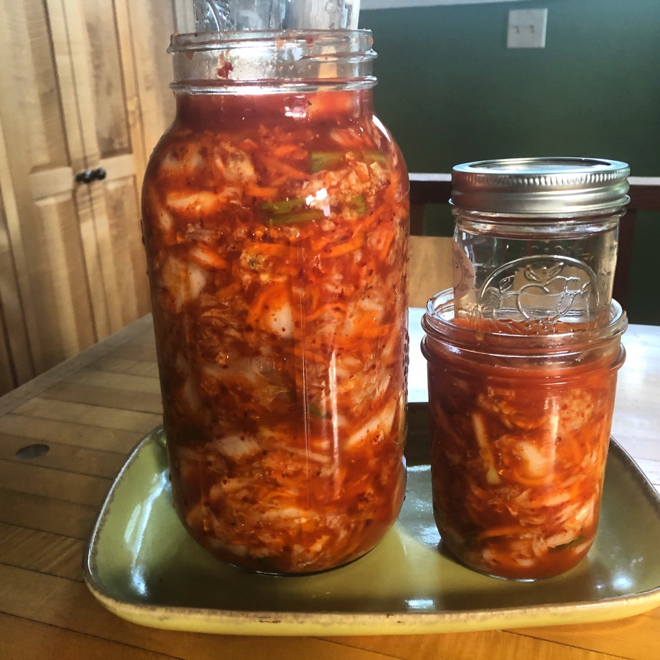 It’s good to check the kimchi once a day and give it a little stir with a wooden spoon to push any pieces that might have escaped to the top back in. Ideally the fermentation container will be in a moderately warm environment, low 70′s is perfect. At that temperature it will take approximately 3-5 days to complete fermentation. I’ve definitely made batches in cooler weather and they were just fine but took a bit longer. Taste! don’t be afraid to taste everyday! 2 or 3 days into it you will notice the bite of raw vegetable has dissipated. A day or two after, when you remove the weight, you’ll smell the sweetest, most delicious smell. then you’ll know your nearing the end of the fermentation process. It’s really up to you and your taste buds to decide on when it is ‘done’. Note: if something has gone wrong there is usually no question, your nose will know. It will smell bad. But this has never happened to me, and if you make sure your utensils, vessels and hands are clean it shouldn’t happen to you either. Transfer to storage jars and store in the fridge for several months. Technically speaking the fermentation process is still happening only at a much slower rate due to the lower temperature in your refrigerator.